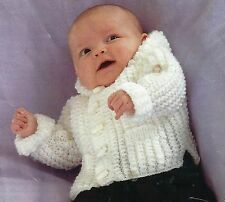 The Pattern : This sale is for the English knitting pattern to create this adorable baby girls Lace Matinee Set. 1: Lace Matinee Coat. 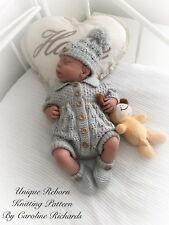 Baby Knitting Patterns and Reborn Dolls Knitting Patterns. The pattern requires approx 250g double knitting yarn (Light Worsted). ALL KNITTING & CROCHET PATTERNS £1.49. Sweater & Cardigans. Double knit yarn. Cable needle. ***PLEASE NOTE: This is a set of INSTRUCTIONS written in ENGLISH*** You are NOT purchasing the knitted clothes or the reborn doll*** This auction is to buy the KNITTING PATTERN ( INSTRUCTIONS TO KNIT) The pattern is designed by me so will be sent to you on colour printed A4 paper in a protective plastic wallet. ALL KNITTING& CROCHET PATTERNS £0.99. IDEAL DOLL OR PREMATURE BABY. Double knit yarn. Baby dolls also suitable for premature baby. Worked in DK. This is aquality printed copy of the original Knitting Pattern for. Includes camisole, petticoat, knickers, dress, hat and cushion. Baby Matinee Coats in 3 designs to knit. KNITTING PATTERN. Double Knit and 4 ply versions included. 1.00 for first pattern and 30p for each extra pattern. 3 designs of Baby Matinee Coats to make. KNITTING PATTERN. Yarn required: Double Knit and 4 ply versions included. 1.00 for first pattern and 30p for each extra pattern. ALL KNITTING & CROCHET PATTERNS £1.49. Ideal Tiny Tears size doll. Double knit yarn. 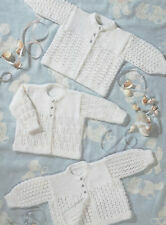 Knitting pattern by Claire's Baby & Doll Handknit Designs for a beautiful matinee set. It fits a 14-24" doll or from premature baby(12" chest) up to 6 months (18" chest). 250g of DK yarn (US: light worsted). (This disk is to fit all Large dolls, Tiny Tears, Luvabella, Annabell, Baby Born, Newborn, Sonni, Baby Reborn and ready to knit Teddy bear clothes so there has to be a pattern in this collection to fit :-). LAYETTE IDEAL PREMATURE BABY OR DOLL KNITTING PATTERN. ALL KNITTING & CROCHET PATTERNS ONLY £1.49. IDEAL DOLL OR PREMATURE BABY. To fit baby VERY PRETTY DESIGN. KNITTING PATTERN. To fit dolls: 12" 14" 16" and 18" tall. 1.00 for first pattern and 30p for each extra pattern. Knitting Pattern (INSTRUCTIONS). 17-19" Doll, premature Baby is knitted on 3.75mm (9) and 3.0mm (11) Needles. Knitting pattern by Claire's Baby & Doll Handknit Designs for a beautiful dress with knitted in apron, inspired by Alice in Wonderland, pants, bonnet and shoes set. It fits a 16-22" doll or from early baby(14" chest) up to 3 months (16" chest). A lovely, easy to knit lace pattern especially for baby girls. You will receive the instructions to knit the long sleeved lace patterned matinee jacket, the Headband with Flower and the Mary Jane Style Shoes. Knitting pattern copy to make a layette for a baby doll. KNITTING PATTERN. Yarn: Double Knit. To fit doll height: 12/14" - 15/18" - 19/22". Dress, Matinee Coat, Bonnet, Bootees and Blanket. A knitting pattern to knit a Mouse outfit comprising of Cardigan, Leggings, Hat and Boots. Premature baby 150 g of Main Shade, Double knitting yarn, 50 g of Contrast Shade double knit yarn. Knitting pattern (instructions). Molly' A gorgeous pattern to knit this little girls romper outfit. Romper is button fastening to the back bodice. You will receive instructions to knit the romper, bonnet and booties. Once knitted the set is suitable for Newborn Baby Girls if knitted in Double Knitting Yarn or if knitted in finer 4ply the finished outfit will fit an early baby 3-5lb or a 16in reborn.